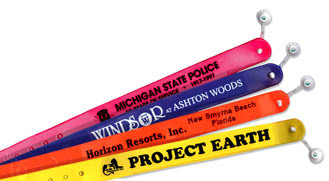 Gate Passes: Identifies paid patrons at events, fairs, theme parks, spectator sports, rock concerts, or the circus. Color Code different weekday passes or seating blocks. Tour Group ID: For schools or travel tours visiting museums, theme parks and cities. Teams may be color coded at college and other sporting events. Swim Training: Use different colors to identify teams; also strong, weak or non-swimmers. Competitive Entrant passes: events such as marathons, cycling, triathlons and more identify participants and vehicles such as cycles, boats and others. You might have some Creative Ideas of Your own . . . The one-size fits all vinyl, weatherproof, permanent WRISTLOK® adjusts to fit and lock onto the wrists of children and adults. This item is available in a variety of colors, is light in weight and works well for most applications. They are stocked blank in most colors for virtually instant shipment, or may be custom imprinted with your logo, message or company name. Comes 12 per tear-apart sheet. 10 Standard Colors: Red, Orange, Yellow, Purple, Kelly Green, Forest Green, Sky Blue, Royal Blue, Black and White. Size: 5/8" x 9 3/4"
Imprint Copy Area: 3/8" x 4"
Shipping: Usually less than 10 working days. This fully adjustable, vinyl REUSABLE I.D. BAND may be used over and over again by children and adults. Ideal for identifying people at repetitive events or where security is not an issue. Ships 12 per tear-apart sheet. Copy Limit: 3/8" x 4." 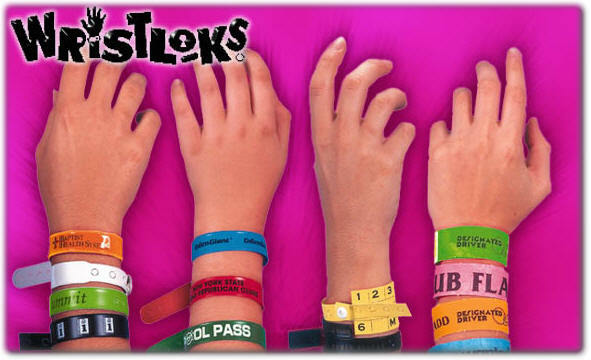 Our exciting permanent TYVEK® WRISTLOKS® are the most economical wristbands available. Made of tough, durable, DuPont Tyvek® material they will not tear or stretch. They may be used indoors, outdoors, in the pool, on rides, for marathons, for parties, theme parks & more. 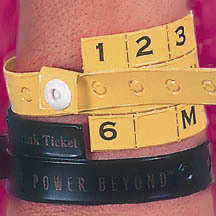 TYVEK® WRISTLOKS® may be consecutively numbered for tight cash or other control. Our strong adhesive will only come apart if the product is destroyed. This item may be written on or personalized with a fine tip marking pen. Product comes 10 per tear-apart sheet. Copy Limit: 3/4" x 6." Consecutive Numbering: Add 0.08 cents each cost per unit for all bands shown on this page. Numbering is in Black only. Shipping: Usually less than 5 working days. Each comes with 10 tear-off tabs which are numbered 1-10 or are printed $1.00 (or other amount) on each tab. TABBERS™ come 6 per tear-apart sheet. Size: 1 1/2" x 9 3/8"
Copy Limit: 3/8" x 2 1/2"
New Custom Molded Wristbands are the perfect item to promote your message or cause to kids, teenagers, young adults and people of all age groups. Wristbands and awareness bracelets are sweeping the country. Everyone from athletes and politicians to celebrities and students are wearing them. 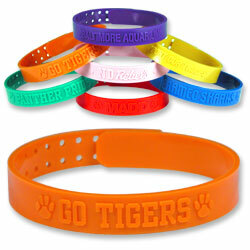 Wristbands are great for awareness programs, fundraisers, school spirit and corporate promotion giveaways. 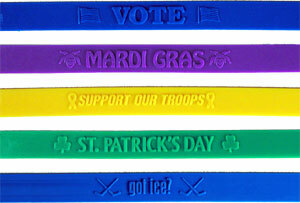 Bracelets are great for awareness programs, fundraisers, school spirit and corporate promotion giveaways. New Custom Molded Bracelets / Wristbands are the perfect item to promote your message or cause to kids, teenagers, young adults and people of all age groups. Awareness bracelets & Wristbands and are sweeping the world.